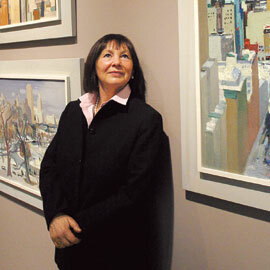 The painting is part of a large, one-artist collection owned by Poznanska and her husband, Kazimierz Poznanski, professor of international studies at the University of Washington. (Last names differ by gender in their native Poland.) From now through May 11, Frye Art Museum in downtown Seattle highlights 50 pieces from the collection in an exhibit titled “Path of the Sun: The World of Teng Chiu.” It includes a retrospective of oils by Chiu, a once-famous Chinese artist who spent his adult life in the Western Hemisphere.